A YOUNG mum turned BLACK after her GP failed to spot a life-threatening illness which could kill her by the age of 30. The family of Louise Grimshaw, 20, say a doctor failed to spot signs of the rare Addison’s Disease, despite her father having to carry her into the Leigh surgery as she couldn’t walk. Her family was told to “take her home and feed her up” but now say she has as little as nine years left to live and an urgent heart transplant is her only chance of survival. The GP has been rapped by the General Medical Council who said he failed to carry out an adequate examination. Louise’s mum, Sharon, 54, said: “She was basically dying before our eyes. She was completely black. If the doctors had diagnosed her when her dad carried her in that day the disease wouldn’t have gone to her heart. She has had to learn to walk, talk and swallow again. Her whole life has been ruined, it’s devastating. Louise, mum to three-year-old Amelia, first visited her GP at Leigh Family Practice, after becoming weak - a classic symptoms of the condition. But instead of tests being done to determine a diagnosis, she was told to take salt tablets. 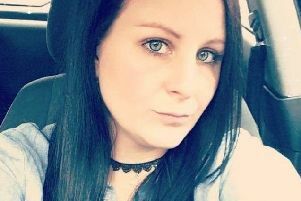 She visited the doctors on five separate occasions in June and July last year, and dropped to five stone in weight, before turning completely black. The day after she last attended her GP, Louise collapsed after her liver and kidneys started to shut down and the disease began to attack her heart. She was taken to Warrington Hospital where she was diagnosed with Addison’s disease, a disorder that occurs when the body produces insufficient amounts of certain hormones in the adrenal glands. She was put in intensive care for a week and transferred to Wythenshawe Hospital, where she spent nine weeks in critical intensive care and had six separate operations. Her mum and dad Gordon were told she had a 40 per cent chance of survival. Sharon said: “It’s been a complete nightmare. What’s worst is that it could have been completely avoided. “If they had just taken a proper look at her and listened to our concerns, she could have been completely treated. Louise, who lives with her partner John Thompson, 21, in Newton-le-Willows, has now had a L-Vad pump put into her heart, a mechanical device to help it beat. “The family are now waiting to hear if she can be put on the transplant list. Her case was referred to the General Medical Council who concluded that a doctor at the practice had failed to spot that she had Addison’s.